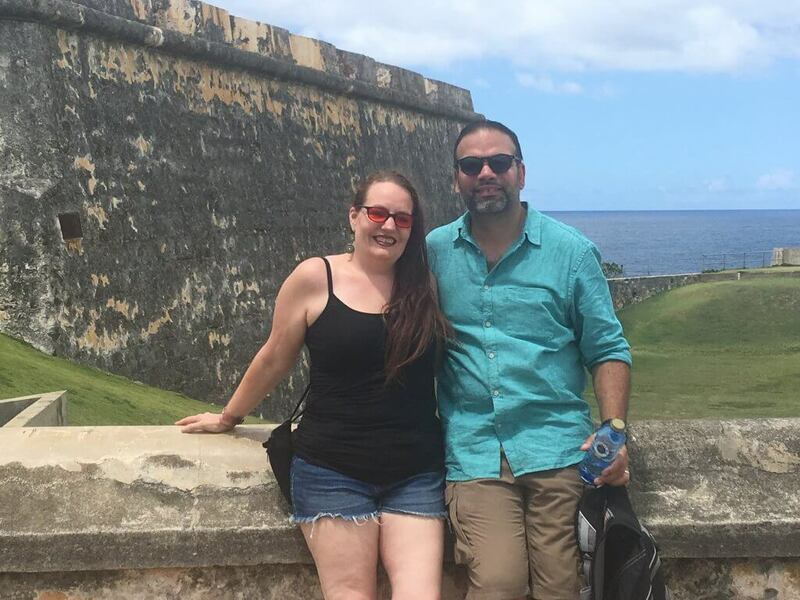 My wife and I spent three days in San Juan, Puerto Rico for our 21st Anniversary. She is newly diagnosed with Celiac disease, and we worried about our ability to travel with her current dietary restrictions. However, searching for a gluten-free breakfast in Puerto Rico was not as hard as we had anticipated. Located on Calle de San Fransisco in Old San Juan, Puerto Rico, Café Berlin was brimming with an atmosphere. The restaurant had a wonderful blend of traditional and modern elements. The large window in the front let in tons of natural lighting. Local art hung on the walls, and the tiled floor was a beautiful design which reminded me of old Spanish haciendas. The tables were not too close together, and an outside seating area overlooked Plaza Colon where when the cruise ships are in port, local artisans set up booths and sell their goods. And there was a beautiful view of the San Cristobal fort from the outside seating area. We worried whether or not the restaurant could accommodate my wife’s dietary restrictions, and if we would be able to clearly express our needs without being able to speak Spanish. The wait staff all spoke perfect English, and immediately understood when we told them of her food allergy issues. The waiter explained their process of addressing our cross-contamination concerns. By the time we finished speaking, we felt completely comfortable eating there. I am very happy to report that my wife did not get sick at all. We ordered the Old San Juan breakfast which includes 2 eggs any style, sauteed potatoes, your choice of ham, bacon or sausage (the big ones not the breakfast links), a petite GF pancake, GF pita bread and guava butter so delicious I could eat it straight with no bread! We sipped on Spanish lattes. The food was seasoned well, and very tasty. Again, that guava jelly was incredible! The cafe felt very comfortable and familiar. The menu had interesting options but had mainstay dishes which will make you feel like you’re eating at someplace familiar. Budget wise, Café Berlin is reasonable, and the portions are very generous. Overall we spent approximately $40 for two on a big breakfast and lattes in a beautiful location. We did not leave feeling hungry and could’ve taken home leftovers had we not wanted to carry it.